Insufficient wood beam 22ft-9 in slong supporting second floor resulting in excessive deflection and vibration. The owner engaged an architect to provide framing plans. The plans called out a ‘wood beam’ to support the 2nd floor where the wall was removed. The builder redesigned the framing on his own authority. The owner noted that the new beam was sagging under dead load plus light furniture load (live load). The owner stated he was concerned because the floor system vibrated when an outside door was closed quickly. 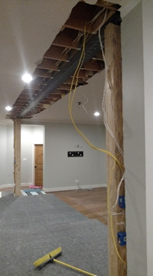 The correct beam size and type to adequately and safely support the floor loads from both sides (existing floor and new addition) was a W 10 x 49 steel beam, where W denotes wide flange, 10 is the depth in inches and 49 is the weight in pounds per foot of 1,115 lbs. The nailers were attached to wall studs though sheetrock using 3’ nails. This resulted in 1” penetration into the studs. 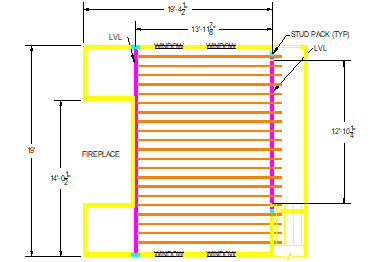 The 12’ 10” double 2 x 12 beam at the balcony was over stressed for the code specific design load. Also, the 19.5’ double 2 x 12 beam was significantly over stressed. 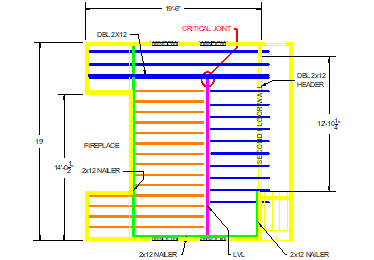 The LVL beam was framed into a long double 2 X 12 beam on one end (critical joint) and to a nailer plate on the opposite end (very weak connection for main girder). The studs behind the nailer plate were supported by a double 2 X 6 header over a window thus the end reaction of the LVL beam was ultimately transferred to a window header. The floor joists would connect to the LVL beam on one end and the nailer at the other end. Add a LVL beam at the 12’ 10” opening. Some costs controlled by using the already purchased 16’ long LVL for this beam. Stud pack columns were added in the walls at the ends to support this beam. 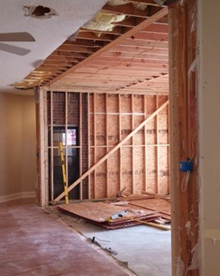 The nailer at the fireplace was removed and a 3 ½ x 11 ¼ LVL was added adjacent to the studs at the fireplace. Again, studs were added in each wall to support the new beam. The 19 ½ ‘ long 2 x 12 floor joists were cut and connected to the new LVL. Finally, the floor was framed with 2 x 12 joists at 12’ centers. The framing is shown above. All nailers were removed.